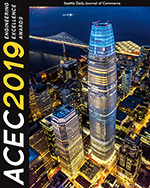 Magnusson Klemencic Associates won ACEC Washington’s platinum award for its structural design of the 61-story Salesforce Tower in San Francisco. It’s anchored by a foundation system that reaches more than 300 feet deep. Magnusson Klemencic Associates was once again the top winner in the American Council of Engineering Companies of Washington's annual Engineering Excellence Awards program. 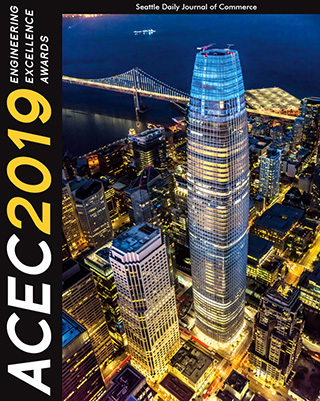 MKA took home the top honor — the platinum award — for the 1,070-foot-tall Salesforce Tower in San Francisco. Sponsored by ACEC's Washington state chapter, the awards program recognizes projects that represent a wide range of engineering achievements and demonstrate the highest degree of skill and ingenuity. Twenty-nine projects were honored in this year's program (including one that won in both the national and Washington state competitions.) The top national awards will go on to compete in the ACEC national competition in Washington, D.C., in May. John D. Hooper, director of earthquake engineering at MKA, was named Engineer of the Year. Project entries were evaluated by a six-judge panel: Bob Axley, engineer emeritus at Wood Harbinger; Bill Bender, chair of the University of Washington Department of Construction Management; Amy Haugerud, engineer emeritus at RoseWater Advisors; Steve Johnston, engineer emeritus at Landau Associates; Supriya Kelkar, Sound Transit; and Benjamin Minnick, construction editor at the Daily Journal of Commerce. ACEC Washington is a professional trade association representing consulting engineering, land surveying and affiliated scientific and planning firms statewide. Copyright ©2019 Seattle Daily Journal and DJC.COM.